This is an honest JapanesePod101 review and has my own opinions. I’m sure each person using the program will think of it differently, so it’s worth checking out for yourself if this is something for you. 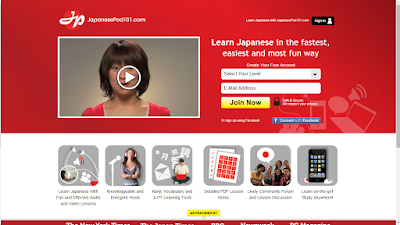 JapanesePod101 is a website which provides Japanese lessons from beginner to advance, using audio lessons, so if you are an auditory learner this might be a good one for you. This post looks at the resources JapanesePod101 provides and it’s pros and cons. You cannot explore the website without signing up. The front page opens with a brief description of what they offer and a video that auto-plays when you open the page (very annoying). The first thing I need to point out is when they say “Create Your Free Account” it is not exactly true. 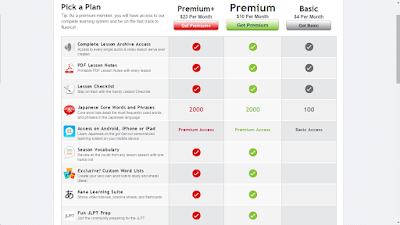 “A FREE lifetime account” seems to been JapanesePod101’s slogan, when really it’s not exactly “free” if you want to get the most out of it. You get a 7 day trial of their Premium account after which you are returned to a free account. The following outlines what each account offers (they list more on their website but this is essentially it). My first impression after signing up and getting the “give us money now – one time only offer” page after I signed up was… annoying. As was the constant reminders on the website that I should give them money for the premier accounts above. I signed up to use the Advanced sections so I cannot comment on the beginners, but there does seem to be a lot more for beginners than advanced users. I felt like I was hit with a lot of information at first and it was hard to know where to start or how to use the site. Lessons are mostly through sound files, with short (very short) vocabulary lists of about 5 words (have to pay to get vocab lists). 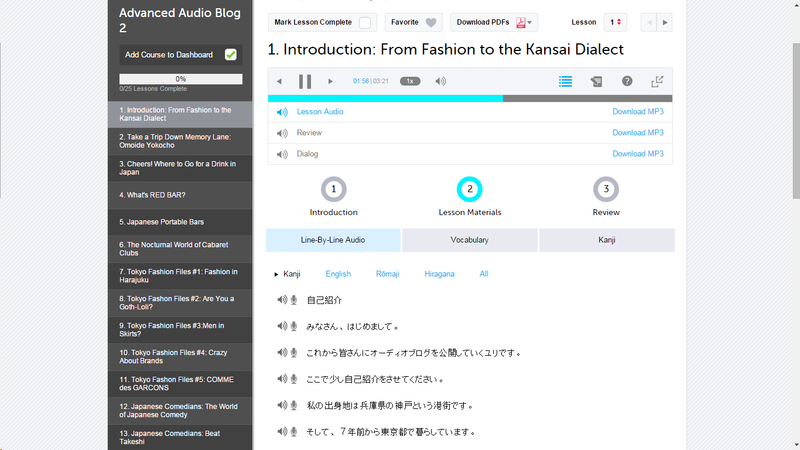 With the free trial I was also able to play with the flashcard program but it’s nothing compared to Memrise. The vocabulary from the lists were not very useful either. It was, however, really useful having a transcript and the ability to break down each sentence and listen to them, rather than flicking through the postcast or pausing and rewinding. – But you can only get this if you pay. The review section has a very short quiz (only 5 words!) but didn’t have anything that teaches you the reading for the kanji – I suppose read the transcript while listening is supposed to tell you? The audios themselves were ok. The subject matter was interesting and there were a LOT for advanced learners. One useful feature is you can sign off lessons you want completed and the front page lists all the courses and what lesson you’re on next. Pushy for money – 15secs at the end of each podcast, large things everywhere saying how I should become a premium member, when on the from page is emphasis that the site is free. The “free” users don’t get much content. 50 second intro on all podcasts is unnecessarily long. I understand they want to direct people to the website if they found those pods somewhere else but 20 secs is just the intro music! Short useless vocabulary lists and quizzes. Spam – lots of emails, many of which are not for the level I’m signed up for. Would be more useful to receive emails that are only for my target level, or ones for target levels I select. I think that if you’re a beginner and an auditory learner then this might be a good website for you if you’re willing to pay the monthly fees to get the most out of it, and willing to put up with spam and unnecessary introductions to audio files. Otherwise, it’s not a very good resource for learning Japanese. 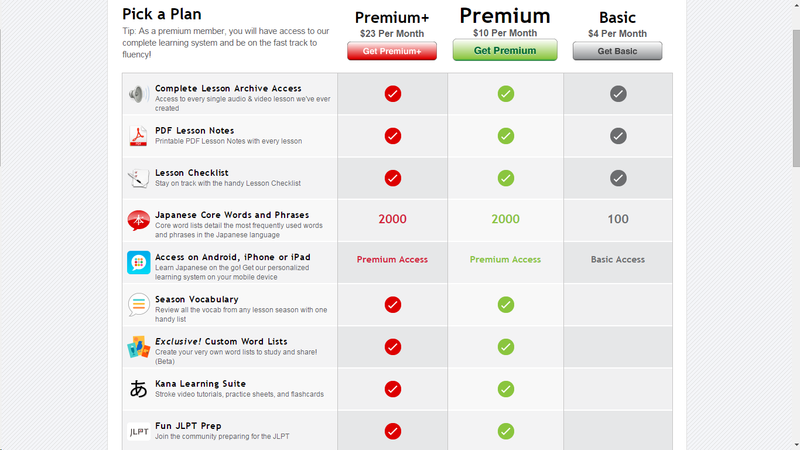 There are MANY more options out there for learning Japanese, most of which are FREE. I strongly suggest you don’t waste your money on this greedy poor quality website. Tagged Review of Japanese resources.